Self-confessed daredevil Verdun Hayes is the UK’s oldest person to jump out of a plane. Next year, the great-grandfather has his sights set on breaking the world record. When I was a young man, I’d never have imagined that for my 100th birthday I’d be jumping out of a plane from 10,000ft alongside my great-grandsons. But I expect I’d have been happy to know I’d reached such an old age. I’ve always been a bit of a daredevil. I’d be the one diving into the river from the bridge. I once ran over a viaduct, which was 86ft high, on a wall that was 18in wide. Foolish is the word. For my 90th birthday I went up in a glider for a short flight. I took control and flew for about 30 minutes. It was a great experience — so silent. It whet my appetite for the skies. I’d wanted to do a tandem skydive then, but my family talked me out of it. This time I wasn’t having any of it. I’m over 100 now, I thought, I’ll just do it. Happily, nobody tried to make me change my mind this time. Two of my great-grandsons, Ben, 28, and Jack, 26, came out behind me. I wouldn’t say they’re daredevils like me, but some time ago we shook hands on it and said we’d make a date. They didn’t suggest it, it was me leading them astray. Before I retired at 65, I was a master builder in Somerset. I’m still active, a little tottery, but that’s to be expected. I use a walking stick at times. My eyesight is good, and so is my hearing, thanks to a hearing aid. I was worried I wouldn’t be allowed to, because of my age. The Parachute Association put me in touch with a doctor at the airfield. He asked, “Can you jump off a chair and land on two feet?” and I nodded. “Oh, you’ll be all right then,” he said. He didn’t ask me if I’d fall down afterwards. The night before the jump, I didn’t feel nervous. By the morning, I was thrilled to bits. When we reached 10,000ft, the instructor I was strapped to said: “Here we go then.” He’s done 10,000 jumps, so I’ve got a bit of catching up to do. We jumped out and started to free fall for about a mile. The weather wasn’t ideal, so I couldn’t see a thing. I thought to myself, “Oh, that’s queer.” Then it dawned on me that we were going through a cloud. Dropping through the sky was incredible. When the instructor opened the parachute a few seconds later, there wasn’t a jolt — it was all very smooth. I could see towards south Wales, the Devon coast and Torquay. There were strings to pull, to turn left and right. I had a go and turned to face inland. I felt like a bird. The whole experience was beautiful, I’d do it again tomorrow. The world record for the oldest person to skydive is 101 years and three days, but I hold the UK record. After I turn 101, I’ll go for the world record. One of the things I’m most proud of is my Legion of Honour medal, which I received on my 100th birthday. It’s given to people who fought in the last world war. That was like going through hell. I was wounded, but nothing too serious, and I came home in one piece. That’s something to be grateful for. It’s been three years since my wife, Hilda, died. We’d been married for 76 years and we were courting for four years before that, so I knew her for 80 years. I can’t say I was thinking of her when I jumped, but there are so many times each day that I do. We had one of the happiest marriages anyone could wish for. We had two children, a girl and a boy, and now I have five grandchildren and 14 great-grandchildren. It’s quite a family. A lot of them were there the day I did the jump — as many of them as could be. They were very proud of me. 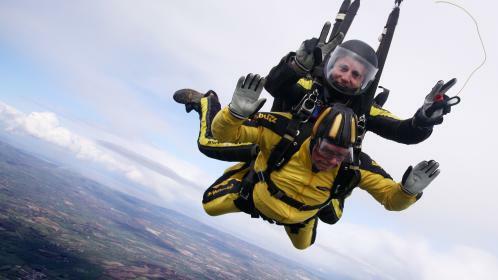 I did the jump for the North Devon Hospice. I’ve raised £5,000 for them so far. I would encourage people to do a skydive. Other people might be scared, but I’m fearless in that sense. I wish I’d done it when I was younger, but we didn’t really have the money. Over the past 100 years, I’ve seen the world change a huge amount — from oil lamps to electricity to all these mod cons. I can hardly believe it, actually. I don’t consider myself an inspiration, I’m just living life to the full. My secret for a long life is to keep busy, keep active and always challenge yourself.